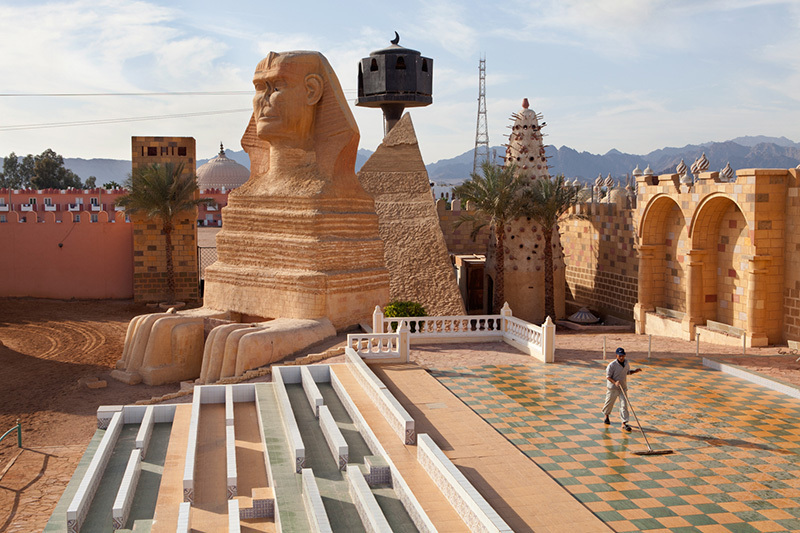 “Sinai Park” explores the consequences of mass tourism in the region of Sinai in Egypt that relies exclusively on this industry, although it is seriously affected by the Arab spring and the political tensions in the region. The Sinai cost, covered with ghost resorts, is a desolate territory. The bedouins suffer from a strict policy of military control, and remain mostly excluded from the tourist business, that represent 86% of the estate of the peninsula. On this piece of land, the strategic point between Africa and Asia, the development of the tourist industry led by investors from Cairo and the Golf area have completely transformed the region with oversized constructions and artificial and naive architecture. Today, the Sinai region with it’s scenery of one thousand and one nights, fitting with the tourist’s expectations, has become a giant “non-place” following the expression of the ethnologist Marc Augé: a world disconnected with the local reality, conforming to the imagery of a stand folklore, giving a false sense of security.